Advanced discount system is a feature that can allows you to create an unlimited number of Coupon codes and Discounts for their customers. To enable it just go to “Settings > Check-out > Enable Advanced Discount System”. It’s a complete and flexible tool that can be used to reward your most valuable customers or to increase the sell-out of specific services offering a wide range of very targeted discounts. You can offer a percentage or a fixed amount discount that will be applied on the total booking order amount by entering a code that you have previously provided to your customers. This kind of discounts will be applied automatically on checkout process when one or more rules, previously defined by you, are met by the customer’s order. 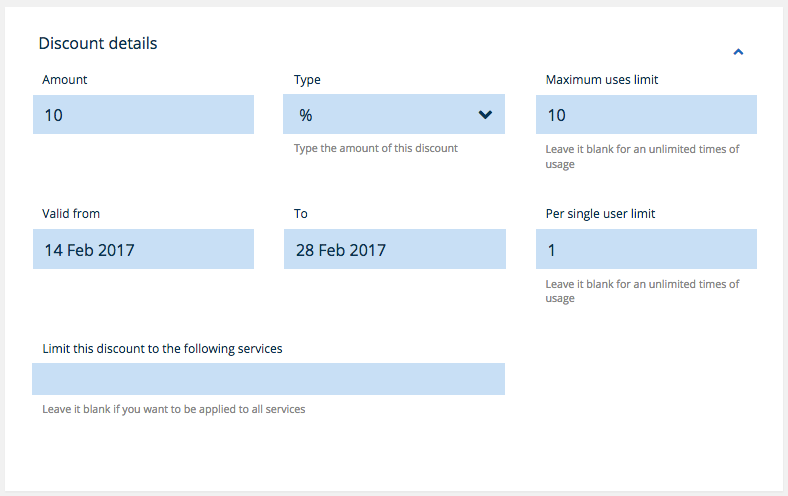 For every “Automatic discount” you can set one or multiple rules to decide who and when that discount need to be automatically applied. Let’s see in detail how to create a discount. First you need to install and activate the plugin. Then you can go to “Salon Booking > Discounts” section and click on “Add discount”. Coupon code or Automatic discount? After you set the discount general settings you need to decide how this discount need to be applied. As a Coupon code or automatically when specific conditions of the booking order are met. In case you opt for the “Coupon code” you just need to copy the provided code and give it to the customers you want. If you decide for “Automatic discount” then you need to set its rules. The number of reservations made by a customer. Let’s say you want to reward those customers that have made at least 100 reservations at your salon. The total value of the reservations made by a customer. Let’s say you want to reward those customers that have collected a total of 1.000$ on reservations at your salon. You can specify when this discount can be applied defining a date range. Let’s say you want to offer a special discount during Christmas holidays then you could set a date range that starts on December the 25th until the 30th. You can specify which days of the week the discount will be applied. Let’s say you want to increase the reservations on those week days that are less busy. For example on every “Wednesday”. You can decide to set just one rule or a combination of multiple rules. NOTE: Be aware that if you create more discounts that conflicts among them, the system will privilege the most recent one.